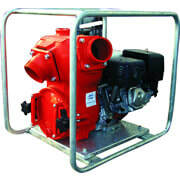 Rugged trash pumps in 2”, 3” and 4” with flows to 1800 lpm, heads to 27 metres and suction lift to 7.6 metres. 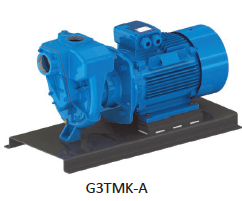 Pumps feature a big front mounted cleanout port and high SG, cast iron, non clog style, open impeller and volute system designed to pump solids in suspension and resist wear. Varisco ST-R series mining pumps are recirculating self-priming pumps suitable for handling liquids with large solids in suspension. They are mounted above and out of the liquid to be pumped, enabling inspection and maintenance of the pump, drive and motor with greatly reducing health and safety hazards for maintenance personnel. The special design of the volute enables the pumps to prime and reprime automatically even without check valves. If the impeller should be clogged by rags or stringy materials, the large front cover can easily be removed to provide full access for inspection and maintenance. The entire rotating assembly can be removed from the pump casing without dismantling the pipes. Varisco ST-R self-priming trash pumps are your best choice for difficult pumping applications: solid construction, easy installation and maintenance. replaceable wear parts. They feature both front and rear wear plates, protecting both the impeller and the seal housing from wear and reducing overall maintenance costs.